Welcome back to another week of Fantasy baseball. We’re into mid-June now, and it’s Father’s Day weekend. So take advantage of all those delinquent owners spending time with their kids and raid the wire! This week, the Twins, having dropped to third in the AL Central, got a boost by activating 1B Joe Mauer (neck/concussion) from the DL; Evan Longoria broke a bone in his hand and may require surgery; and Ron Guidry believes his Yankee single-game strikeout record of 18 will be broken by Luis Severino. 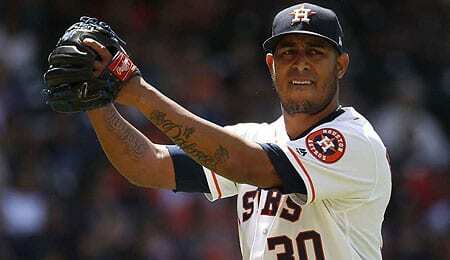 Hector Rondon, RP, Houston Astros (ESPN: 20.4 per cent; CBS: 40 per cent): While Houston Manager A.J. Hinch is driving Fantasy owners crazy with his musical closers, Rondon did bag three straight saves last week before ceding to Ken Giles on Tuesday. Rondon has put up 12 straight scoreless outings, making him — for the time being — the reliever to own in Houston. He’s getting a slightly bigger workload this year, responding with a career best 1.44 ERA and tremendous command (30 strikeouts against just five walks). Just two years ago, Rondon was closing for the Cubs, so he’s got plenty of experience. He pitched a perfect ninth in a non-closing situation to seal the win Thursday, so clearly this is a fluid situation, but we suggest you grab him. The portly Venezuelan righty has always been a good source of Ks, averaging 9.2 per nine innings over his MLB career, and like all good relievers, he sure knows how to get ready in a hurry (see video below). Matthew Boyd, SP, Detroit Tigers (ESPN: 19.9 per cent; CBS: 44 per cent): Boyd has a tendency to fall behind hitters, and that sometimes hurts his efficiency and ability to go deep into his starts, but it’s hard to argue with how effective he’s been, peripherals aside. Although it’s not a huge part of his arsenal, his K rate is up lately (11 in 11 1/3 IP over his last two starts) and he’s poised to shatter his career high in innings pitched in what’s quietly been a breakout campaign. Boyd hasn’t given up more hits than innings in a start since May 1, and with a 4-4 mark and solid ERA, he’s definitely worth owning in AL-only or deeper mixed leagues. Freddy Peralta, SP, Milwaukee Brewers (ESPN: 4.2 per cent; CBS: 22 per cent): Peralta is expected to get another crack at the Brewer rotation, starting Tuesday. Considering the amazing strikeout potential he flashed (13 in 5 2/3 IP in his MLB debut), he’s worth a speculative add. Peralta has mostly dominated since going back to Triple-A (2.75 ERA with just 45 hits allowed in 59 IP), but he’ll need to sharpen his control if he hopes to go deeper into his starts in the bigs. Identified as a potential suitor for Jacob deGrom, Milwaukee may be bringing Peralta up to showcase him for a trade. Mike Montgomery, RP, Chicago Cubs (ESPN: 13.9 per cent; CBS: 45 per cent): Montgomery, who gets two starts this week, has really shined since moving back into the rotation thanks to Yu Darvish getting hurt. Montgomery has a brilliant 1.14 ERA through four starts, with 14 Ks. He’s been a bit easier to hit this year, but is still enjoying solid rates in that regard. Expect him to remain in the rotation, making him worth grabbing in all formats. Jedd Gyorko, 3B, St. Louis Cardinals (ESPN: 3.5 per cent; CBS: 15 per cent): Gyorko was 0-for-4 Friday, continuing a horrid slump in June. So why are we pimping him? His PT has been inconsistent given the Cardinals’ roster makeup, but Gyorko is likely to get a few days in a row to play with Jose Martinez on paternity leave. We expect this will give him a chance to get going, and when Gyorko heats up, he can be very useful. On Monday, he launched his fifth dinger and had two hits on Wednesday, so signs of him emerging from the slump have already begun. Caleb Ferguson, SP, Los Angeles Dodgers (ESPN: 0.3 per cent; CBS: 3 per cent): With yet another Dodger starter (Walker Buehler) now out, next in line is Ferguson. Ferguson has received two starts so far, an abbreviated one in which he was wild, and then a better performance last time out. He’ll get another start Sunday against the Giants, and we’re expecting better results from the southpaw, who has a very deceptive delivery. He bears watching, at the very least. Ty Blach, SP, San Francisco Giants (ESPN: 1.9 per cent; CBS: 15 per cent): Blach flamed out in the rotation at the end of May as the losses piled up, but he proved he’s still capable, tossing 6 2/3 shutout innings of relief on Thursday (including a whopping 13 groundball outs). We love his groundball rate (56 per cent), and believe he’d enjoy much more success on a better defensive team. Jonathan Loaisiga, SP, New York Yankees (ESPN: 13.2 per cent; CBS: 28 per cent): Loaisiga, thrust in the rotation with Masahiro Tanaka hitting the DL, hurled five shutout innings for the win in his MLB debut on Friday. Loaisiga began the season at High-A, going undefeated with a brilliant 1.35 ERA through four starts before a promotion to Double-A. Considering he had only tossed 25 IP above A-ball, it’s surprising to see the Yanks bring him to the Show, but he didn’t look overmatched in the least. Man, the Yanks’ system is loaded with prospects. We’ve spent many an evening over the years seeing long-time local legends, Shadowy Men on a Shadowy Planet, at various bars and concert halls around the city. Here, they perform their classic “Good Cop, Bad Cop,” at Lee’s Palace in Toronto on July 15, 2012. Is Father Time finally catching up with Ortiz as he inches toward 500 career dingers? He definitely seems to need more rest this season — especially against tougher lefties.